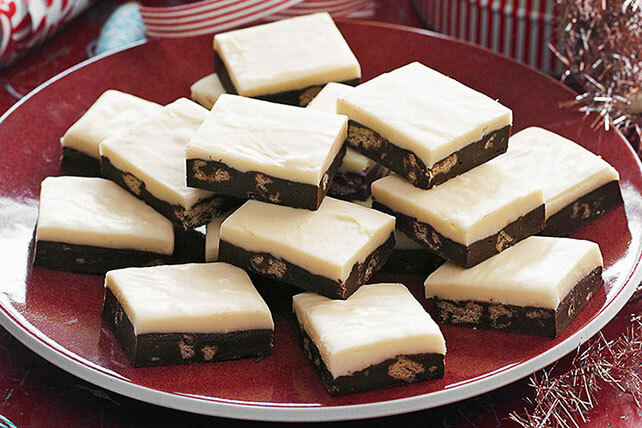 If you can chop cookies and use a microwave, you have all the know-how required to make this easy but impressive Two-Layer Cookie Crunch Fudge. Line 8-inch square pan with foil, with ends of foil extending over sides. Microwave semi-sweet chocolate and 2/3 cup milk in medium microwaveable bowl on MEDIUM (50%) 1-1/2 min. or until chocolate is almost melted, stirring after 1 min. ; stir until completely melted. Add chopped cookies and vanilla; mix well. Spread onto bottom of prepared pan. Microwave white chocolate and remaining milk in separate microwaveable bowl on MEDIUM (50%) 1-1/2 min. or until chocolate is almost melted, stirring after 1 min. ; stir until completely melted. Spread over dark chocolate layer. Refrigerate 2 hours. Use foil handles to lift fudge from pan before cutting into pieces. Enjoy a serving of this chocolatey treat on a special occasion. Omit cookies. Prepare as directed, stirring 4 drops green food coloring and 1/4 cup crushed peppermint candies into white chocolate mixture before spreading over dark chocolate layer in pan, and sprinkling top of uncut fudge with additional 2 Tbsp. crushed peppermint candy before refrigerating. Wrap remaining fudge in plastic wrap and store in the refrigerator.